Rebecca A. “Becky” Anspach, 76, of Tiffin, passed away Saturday evening, Sept. 23, 2017, at Mercy Health – St. Vincent Medical Center, Toledo. She was born Aug. 2, 1941, in Tiffin, to Joseph and Mary (Clapper) Spencer. She married William C. Anspach Jr. Jan. 6, 1962, in St. Mary Catholic Church, Tiffin. Survivors include her husband, Bill of Tiffin; son, Scott (Anne) Anspach of Durham, North Carolina; daughter, Kimberly (Mike) Scheerer of Tecumseh, Michigan; two sisters, Jeannie Penny of Portland, Oregon, and Sharon Van Nette of Panama City Beach, Florida; and two grandchildren, Cory Scheerer and Eric Scheerer. 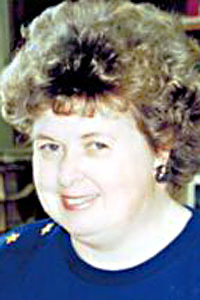 Becky graduated from Tiffin Calvert High School in 1959 and was an educational aide at Washington Elementary School for 40 years, retiring in May of 2011. She was famous for her double frosted brownies. She also was a Cincinnati Reds fan, enjoyed reading, shopping, collecting angels and spending time at Lake Vermilion. Becky loved her work at Washington Elementary and especially loved spending time with her grandchildren. Her Mass of Christian burial will begin at 1 p.m. Thursday, Sept. 28, 2017, at St. Mary Catholic Church, Tiffin, with the Rev. Anthony Coci officiating. A rosary will be prayed 20 minutes prior to Mass. Burial will be at a later date in St. Mary Catholic Cemetery, Tiffin. Friends may visit with the family 11 a.m.-12:30 p.m. Thursday, Sept. 28, at Hoffmann-Gottfried-Mack Funeral Home & Crematory, 236 S. Washington St., Tiffin, OH 44883, (419) 447-2424. In lieu of flowers, memorial contributions may be made to St. Mary Catholic Church or a charity of the donor’s choice.